EMOTIONAL eating, skipping meals, not being able to find time to exercise when you have children. Men are just as susceptible to putting themselves and their health last as women are — just ask Julius Kieser. 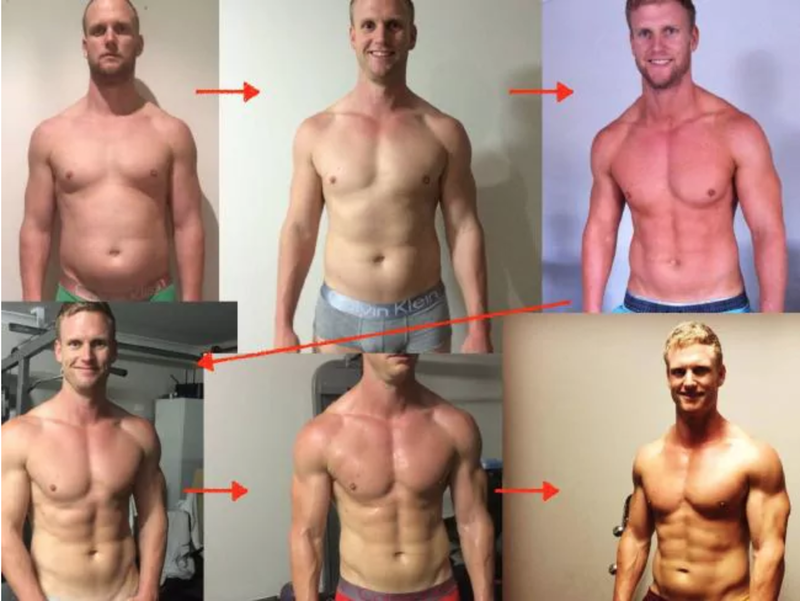 The Sunshine Coast-based father of five is a personal trainer by trade, but as he and wife Sharny’s business took off (you might recognise Sharny from stories like this), he found he was spending more and more time at work, and less time on his own health and wellbeing. Even when fitness is your job, life can still get in the way. Things started to spiral downward for Julius last year, as chaotic family life and the death of his father took its toll on his body. “When I’m happy I shovel extra food in, but I also eat more when I’m stressed. We got so busy at the start of last year, we had another baby on the way, we were moving house, I was eating more. Then my dad died accidentally, and it forced me to reassess everything. “Dad lives in New Zealand. He was just about to go on sabbatical and was out in the backyard trying to shoot a rabbit that had been eating his bulbs. It was raining and he slipped over, and the gun he was holding went off and shot him through the back. He was 64, it was such a shock. It was a chaotic time. It happened the week before my fifth child Hugo was born. “At the funeral I saw my little brother, who works really long hours in a finance job, travelling the world and things like that. We were sharing the childhood room we grew up in, and he whipped his shirt off and I saw his abs and I was like, what?! His abs were crazy! “I asked him what he was doing and it was nothing out of the ordinary really. But cakes and pies and pastas were constantly being brought in, everyone was just eating because they had nothing else to do, but he still managed to make himself a salad, get out and train, and I was sitting there stuffing my face. He doesn’t really know too much about fitness, it’s not his life like it is mine, but I learnt quite a few things from him. He uses exercise as a de-stressor. He makes it a priority. But when Julius set about reclaiming his health, he found that it wasn’t as easy as he’d imagined. “Day one went for three weeks,” Julius admits. “I did try to diet too hard, I tried skipping meals before I settled on a proper regime. I still had that immortality idea going, that I was still young and could lose weight fast. As a young guy you can just sleep off most of your exhaustion, or get back into exercise and see results quickly, but I find, and a lot of my dad mates find, we can’t anymore. Our bodies don’t work in the same way anymore. And rather than doing something about it or changing things, we just get angry! “Before this I was running long distances, but I injured my foot so running has been a nightmare for me. So I did some gym stuff, but mostly because I don’t have much time I was doing really fast workouts for ten minutes to half an hour to get my heart rate going. I did that every day. I also do exercises with the kids, so I didn’t have to go away and leave my wife with the kids — you can do it together and your wife can have a bit of a break, and your kids can see what exercise looks like. It’s very important to me that the kids get to see dad more. “I then made sure that what I ate fitted in with all of that. I started off calculating what it would require to get to a low BMI as far as food goes. I learned everything I could about the mathematics and science of fat loss — If I took X amount of calories out, how much would I weigh in 8 weeks time, that kind of thing. So for breakfast I had a smoothie with a frozen banana, some cacao powder and 500ml of egg whites. “Mid morning I eat one of those jumbo cans of tuna from Aldi with a can of crushed tomato and half an onion fried in coconut oil. Tomatoes are so low in calories, it’s amazing. Lunch is barramundi fillets with veggies, and at night I’d have maybe 500g of steak, or chicken breast, and vegetables again. When you control your food your energy comes back. It’s so much about what you eat. 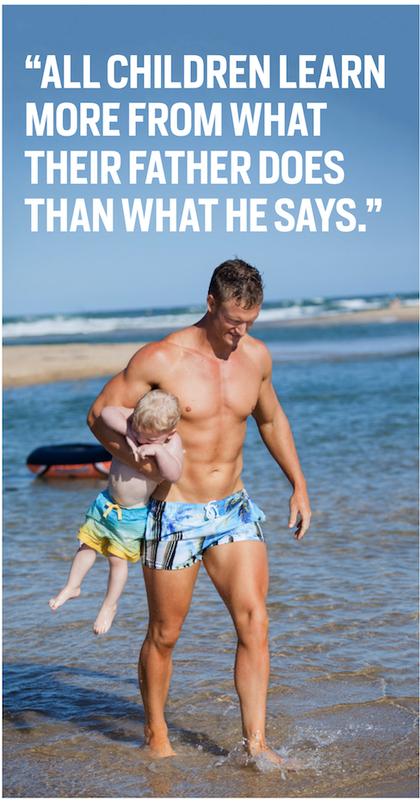 Julius has created FitDad, an online program based on his experiences. 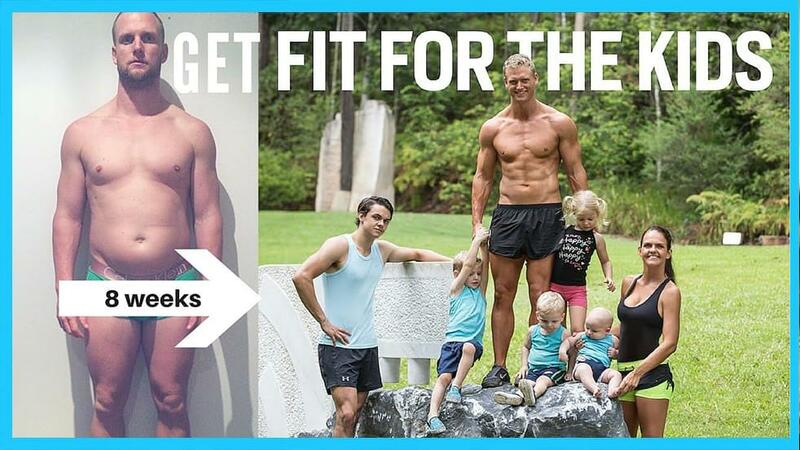 FitDad is an eight week food and exercise guide which aims to get you started on your journey to being fit and healthy, with no big expensive equipment commitments.